Peel the skin of Avocado and cube them in to small pieces. 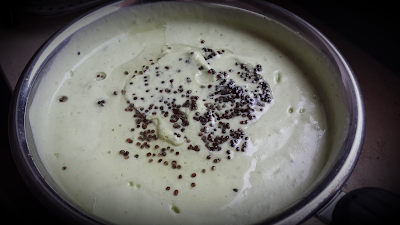 Now take a grinder and grind the avocado with green chillies,lime juice,coriander,ginger,jeera seeds ,salt and yogurt into a puree.Now Avocado raitha is ready. Heat oil in a sauce pan and add in the oil.Once hot add in the mustard seeds and let it sputter. Switch off and temper this on Avocado raitha. Serve as a side dish with pulao or plain rice!